The Managing Director of Tasty Time Nigeria Ltd Mr Isaac Kole was Thursday arraigned by The National Agency for Food and Drugs Agency Administration Control (NAFDAC), before a Federal High Court, sitting in Lagos, for allegedly producing fake products. Kole is standing trial alongside his company, tasty Time Nigeria lts, before Justice Hadiza Rabiu-Shagari. The defendant is standing on a four-count charge of producing fake products. NAFDAC prosecutor Mrs Chinyere Okon,‎ told the court that the defendant and his company have been using his firm located at 1, Kole Street, Ipaja, Lagos to produce unregistered Tasty Time products, which includes Tasty Time juice, Glucosaid Energy drink, Tasty Time Pops orange flavour drink, Tasty Time Fitz Apple drink, and Tasty Time mixed orange flavor drink. NAFDAC further alleged that the defendants also sold the same unregistered products to the general public. The offences according to the prosecutor, are contrary to sections 1(1), 5(a) and 5(e), and punishable under sections 6(1)(a) and 17(4) of Foods and Drugs and related Products Cap. F33, Laws of the Federation of Nigeria, 2004. In view of the defendants pleas of not guilty, their lawyer, Dayo Adamolekun, pleaded with the court to admit his clients to bail on self recognisance, alternatively, on the most liberal terms. Adamolekun hinged his application on his client’s health status, adding that the first defendant, Kole, is an elder statesman, and an employee of labour, who has over 400 employees in his firm. He further told the court that due to the charge filed against his client, his company has been sealed, and the 400 workers are now jobless. The defence counsel also stated that bail is constitutional right of his client as guarantee by the Constitution of the Federal Republic of Nigeria. The prosecutor, did not opposed the bail application. She also told the court that the defendant has been on administrative bail which was granted to him by the agency. In her short ruling, Justice Rabiu-Shagari, said in view of the plea of the defendant and base on his health issue, she will not ask the defendant to go to the prison, but continue to enjoy the administrative bail granted them till Monday, when she will rule on the his bail application. 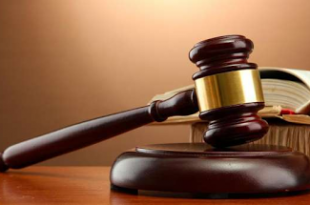 The judge however ordered the defendant to produce a director either from the federal or Lagos State Ministry, Parastatals Departments or Agencies (MDAs), who will sign an undertaken to produce him in court on Monday, for ruling on his bail application.